History, particularly IT history, sure does have a way of repeating itself. Think back to the 80’s and the advent of mini computers. Mini computers were widely adopted by business units because of the perceived difficulty and cost of having the IT organization implement business solutions on the corporate mainframe. In the 1990’s it was the PC. Again, Corporate IT was seen as too slow and too expensive for the business solutions that were needed. In the 2000’s it is the advent of 2nd and 3rd generation Internet applications followed quickly by the mobile computing revolution. Like a broken record, corporate IT organizations were perceived as being slow and expensive to react to these new business demands. Now that we are in 2015, IT organizations are fighting the proliferation of public cloud offerings that business units cannot seem to drink up quickly enough. What is common to each of the historical phases that are described above? Business units that consume IT services perceived that they could procure IT services and applications more quickly and at a lower cost than corporate IT organizations could provide them. What does this mean for the CIO in the modern era of IT? It means that CIO’s must adapt or run the risk of being rendered irrelevant in relation to the way IT is consumed today and into the future. It means that CIO’s must now get on board with the concept of “running IT like a business.” It means that CIOS’s must evolve such they are arbiters of technology and understand economically where is the best place for IT workloads to run. Is it private cloud? Public cloud? Hybrid? Outsourced? Insourced? SaaS? Iaas? PaaS? The choices are nearly endless – and you get it – todays CIO must be versed in all of these capabilities. Todays effective CIO is asking and seeking answers most of the following questions: Can you tell me on the spot what your total cloud spend is, and, what that spend is comprised of? What’s the cost for you to deliver a unit of cloud service (IaaS for instance)? And what about your consumers: Who consumes what service and at what cost? Can you identify the services used and the cost allocation for each service? How is your cost efficiency compared to that of other public cloud infrastructures? How can you use that type of information to optimize the cost of your existing and future operations? How can you create a showback report to each of your stakeholders? Let’s say that you’re the VP of Cloud — think through how you would justify your data center investments. Have you proactively analyzed demand vs. capacity and how this is impacting your forecasting/budgeting exercises? How can you scale dynamically to fulfill your consumer needs? Have you thought about your goal to optimize the cost of delivering cloud services? “What if” scenarios, benchmarking, and the reduction and optimization cost and price of your cloud services should be considered as well. Don’t you need closer monitoring to the quality of your delivery, such as continuous analysis and improvement? Have you thought of aligning your efforts with the corporate marketing and promoting your cloud services value? What I would like to share with you today is a 6-month program (shown in the diagram below) to transform your cloud initiative into a successful robust cloud business management practice. The goal of the Cloud Business Management (CBM) service is to set up a cloud business management practice to enable effective, efficient, and agile business management of your cloud services. The following components are addressed in the full cloud business lifecycle service. Cloud Business Manager Workshop – Educate the cloud service delivery teams on the foundations of cloud business and financial management aspects including costing, pricing, showback/chargeback, budgeting, forecasting, and cost optimization. Cloud Business Strategy Assessment – Evaluate the IT business operational maturity of an organization and compare with VMware recommended practices. VMware will recommend possible strategies and propose a plan that best fits the organization IT and business models. Cloud Services Definition – A comprehensive methodology to define cloud services and their constituent components end-to-end. Cloud Services Costing – Understand Customer’s cloud services cost end-to-end and create a service-based cost allocation and classification strategy for Customer’s cloud services. Cloud Services Pricing – Help Customer set a cloud pricing strategy and propose rates for the various components and offerings. This includes showback, cost recovery, investment funds, and driving particular behavior. Cloud Services Marketing – Set up the cloud services marketing strategy including branding, marketing objectives, cloud service positioning, communications plan, value measurement, cultural considerations, and catalyst of change. Also, identify types of promotions and drivers of cloud services consumption and behavior impact. Consumption and Showback / Chargeback – Help Customer develop a process for reporting on cloud service consumption and billing for cost recovery using VMware vRealize™ Business Advanced. In addition, determine the required people roles and dashboards. Cloud SLM and Contracts Management – A comprehensive Cloud Service Level Management process including SLA and OLA templates between Cloud Infrastructure and Tenant Operations teams and the consumer. Additionally, basic vendor contract management process is provided. Cost Optimization – Develop and execute a cloud cost optimization repeatable process that includes competitive analysis, benchmarking, public cloud comparison, and cost savings realization. Cloud Services Budgeting and Forecasting – Develop a cloud-service-based budgeting and forecasting process to enable a more efficient demand and supply chain supported by the vRealize Business Advance cost model. So, how is this valuable to your organization? In our next blogs, we’ll cover the cloud business management components in greater details to help you plan for your Cloud Business Management (CBM) practice within your organization. And if you’re heading to VMworld, don’t miss this session! IT services and applications gradually rely on cloud services that provide more flexibility and agility for IT providers to supply the value to the business on demand. However this change also introduce new challenges to manage a dynamic environment that needs to scale economically per consumer’s demand. The cloud model can facilitate the shift to a business focus for the entire IT hierarchy—from the top to the technical teams managing and delivering the cloud. But to achieve the full business value of the cloud, companies need to put in place a more specialized and robust Cloud Business Management (CBM) practice. The CBM practice addresses the key business aspects of cloud operations. Khalid Hakim, global operations financial and business management architect, and Kobi Katzir – Senior Product Line Manager at VMware will shed light on this new business practice using VMware vRealize Business to move your cloud management to the next level in maturity and position it as a strategic partner to your business consumers and line of businesses. This entry was posted in CloudOps, IT Transformation, Operations Transformation, Thought Leadership, Uncategorized and tagged cloud business management, CloudOps, IT Financial Management, IT Services, IT transformation, ITBM, VMworld, vmworld 2015 on July 20, 2015 by Sarah Butler. Generally when a company makes a decision to move in a new direction, a lot of analysis and rigor take place to ensure the decision is the right one. Business cases are created and vetted until everyone is in agreement and the project is approved. This is all great and necessary to kick off a new initiative. However, once the project is in motion, how often do we measure the results against the original business case to see if we are delivering on what the company expected? Think about it. A project gets kicked off and everyone is heads down implementing the new changes and making sure they meet their deadlines. Going back to review a business case is usually not a priority and, quite frankly, who has the time? But at some point, senior leadership will ask for an analysis, and one will be created to meet that one-time request. Then, it is back to business as usual—until the next request comes along. What if you could measure the impact IT transformation has on the business proactively and in real time? Projects become more meaningful. Employees can see how their work is impacting the business. Transformation begins to make sense and can be justified. This can be done if you take the time to generate key performance indicators and metrics ahead of time. What is our current state benchmark? How will we impact the business if we reach our target state? Do we have data to measure progress? Usually I see companies measure progress based on financial metrics. For example, did we save the company money? However, there are hundreds of metrics that relate to agility, cost, and quality. The key is to pick those that are most impactful to the processes you expect to improve as part of the transformation. These may not all be financially driven, but will still have a measurable impact on the business. Some of the metrics that fall into these categories are what I refer to as the “hard to quantify” or “soft” benefits. These are generally thrown out or overlooked during the business case development. I believe that once you can quantify these, you can translate them into real benefits and measure their impact on the business. Provided the data exists, I’ve been able to help many clients both track the metrics they decide to measure and demonstrate how they can show the impact IT transformation has on their company. By quantifying these metrics and showing the impact your improvements are making on the business, you will know at any given time if the changes you are undertaking are making a difference or if you are falling short of your expectations. And, you will also be able to identify if additional changes are required to meet the project’s objective. Too often, I see clients lose focus on the reason they started a project. This is easy to do on long projects. People change roles, leadership changes, or other projects take priority. Putting metrics in place and understanding their impact on the business will help you maintain that focus. The qualitative data gathered during implementation and post implementation are important to measure the impact IT transformation has made on your business. The data you collect and analyze will begin to tell a story and allow you to make precise decisions on where additional improvements are needed to make the biggest impact. Matt Denton is a VMware transformation architect and is based in Wisconsin. This entry was posted in Informational, IT Transformation, Operations Transformation, Thought Leadership and tagged IT Financial Management, IT service management, IT transformation, ITSM, metrics, operations transformation on January 16, 2015 by Heidi Pate. In many cases IT does not have an adequate service costing process, which means it does not have a fast, accurate, consistent, fair way to provide cost information about IT services to constituents. And the lack of an effective service costing process is costing both IT and the business—big time. Cost transparency is important not only because IT service users want to know what they’re paying for, but also because it provides an opportunity for IT to quantify its value to the business. If IT can provide accurate cost information, both business and IT leaders can make better decisions about IT investments, outsourcing, cost cutting, business strategy, and competitive differentiation. We’ve all heard the mantra “Minimize IT costs while maximizing business value,” or its short form: “Do more with less.” It’s a core principle of IT business management (ITBM). But without an accurate, transparent service costing process, how can IT leaders truly deliver IT as a service (ITaaS) and run IT like a business? Is it accurate? Does it take into account all of the CapEx and OpEx elements of delivering an IT service? Is it equitable? Does it charge the right constituents the right amounts for IT services, based on their actual consumption—or does it simply charge a lump sum based on voodoo economics? Is it transparent? Can constituents get an accurate breakdown of what’s included in the final price tag and what isn’t? Is it improving IT investment planning? Your service costing process should enable business and IT leaders to create more finely honed investment strategies that cut costs while creating new competitive advantages. Is it? If you can look in the mirror and answer “yes” to all those questions, congratulations—you’re a member of a small minority of enterprise IT departments with an effective service costing process. If not, ask yourself the next logical question: How can you develop a better service costing process? I’ll address that question in my next blog post. So stay tuned. And if you’re heading to VMworld, don’t miss Khalid’s session! This entry was posted in IT Transformation, Operations Transformation, Thought Leadership, VMworld and tagged "cloud computing", "cloud operations", CloudOps, IT business management, IT Financial Management, IT operations, ITBM, ITFM, khalid hakim, operations transformation, SCP, service costing process, VMworld, vmworld 2014 on August 8, 2014 by Heidi Pate. Does IT Financial and Business Management Matter When Implementing Your Cloud? This is one of the common questions that I keep getting from my clients when building IT operations transformation roadmaps. In fact, one of the key considerations of a transformation roadmap is the business management side of your cloud, which often gets deprioritized by key stakeholders. Let’s think it through: Can you tell me on the spot what your total cloud spend is, and, what that spend is comprised of? Here’s another one: What’s the cost for you to deliver a unit of infrastructure as a service (IaaS)? And what about your consumers: Who consumes what service and at what cost? Let’s say that you’re the VP of Cloud Infrastructure — think through how you would justify your data center investments. Have you proactively analyzed demand vs. capacity along with operations cost of your cloud services? How can you scale dynamically to fulfill your consumer needs? Have you thought about your goal to optimize the cost of delivering cloud services? Don’t you need closer monitoring to the quality of your delivery, such as continuous analysis and improvement? If you are the IT financial manager, imagine how you can reduce your long-term commitments by moving from CAPEX to OPEX if appropriate. With financial and business management capabilities, your planning and IT budgeting would be based on actual cloud service demand and consumption practices. You would also be able to leverage benchmarking and “what if” scenarios for your cloud service costing optimization opportunities. What keeps CIOs awake at night during a cloud implementation is the challenge of how they will demonstrate and deliver value for the cloud investment, as well as contribute as an innovator to the business by dynamically supporting growth and transformation as a result of their cloud cost optimization. In fact, your ability to respond at the speed of business through fact-based decision making and responsiveness to changing needs in a dynamic environment is key to your success. The transparency of your cloud delivery value in context of demand, supply, cost, and quality will help improve your alignment with business goals to cloud services delivered. In my next blog, I’ll cover some of the built-in functionality and business disciplines of the VMware IT Business Management Suite that can help you succeed in your cloud delivery and accelerate time to value. Check out the VMworld 2014 Operations Transformation track for opportunities to hear from experienced VMware experts, practitioners, and the real-world experiences of customers transforming their IT infrastructure and operational processes. This entry was posted in IT Transformation, Thought Leadership and tagged IT business management, IT Financial Management, IT operations, ITBM, ITFM, khalid hakim, operations transformation on June 26, 2014 by Heidi Pate. As more businesses recognize the integral role IT plays in the overall success of the enterprise, executive and business stakeholders have higher expectations of IT’s performance and its ability to prove its value. Providing cost transparency back to the business is key to meeting those expectations. That is why today’s IT organization needs to have an in-depth understanding of the costs associated with delivering IT services, enabling each service manager/owner to defend his or her numbers from a service angle (not from an expense code or department/project budget) and hence improve the overall IT service value perception. This highlights the need for a new management discipline that provides a framework to deliver IT as a service and manage the business of IT: IT Business Management (ITBM). Yet many IT leaders do not have the support, knowledge, or bandwidth needed to implement an effective ITBM practice, with its core focus on minimizing IT costs while maximizing business value. When I’m working with customers, I use VMware’s ITBM Service Costing Process (SCP) to facilitate a modular service-based costing approach that offers ease in manageability and operability. In my next post I’ll dig into the details of how the SCP solution is used as well as the benefits and business value it addresses. But first, I want to clarify the far-reaching repercussions of failing to implement these processes. The biggest problem for today’s IT organizations is not insufficient funds or financial management people skills, but rather IT planning, budgeting, costing, allocating, and pricing, all of which are based on by-department cost management. Traditional IT costing methods don’t explicitly call out value-service based structures and bills. They are more focused on costs associated with technology component purchases, projects implemented, cost code totals, department costs, and customer allocations of these non-value-add cost elements. Failure to understand the costs of IT deliverables — Not all service managers are able to understand their end-to-end service costs and defend their expenses due to the lack of true service views, including service catalogs and definitions, as well as service-based cost models. Arbitrary cost cutting and budget shrinking decisions — Management often looks at expense lists from cost-codes or a totals view, not from a service-based view that enables top management to see a holistic path to savings. Random cost allocation — IT’s cost allocation is typically based on policies and guidelines set by the finance management department that are usually technically driven and don’t reflect the full value of IT. Overstated or understated service costs — IT service cost calculations may include superfluous cost elements or exclude key cost elements. This is all caused by lack of a well-defined service-based costing process standard across IT, which results in services that can’t be compared “apples-to-apples” with outside service providers. The “IT is always expensive” perception — Service managers and owners can’t confidently defend their numbers, which results in a common perception that IT is expensive. Lack of trust and value realization — Due to the lack of value-centric conversations and full service-based cost transparency, talks tend to focus on numbers instead of the true value delivered to the business. As long as services are not being managed as business, then customers will continue to question what their money is buying. Data does not support making meaningful decisions — One of the biggest challenges IT faces without an ITBM SCP is unreliable and inaccurate financial data related to IT assets. Poor budget processes or lack of budget clarity —The traditional IT budgeting process follows a limited approach that limits IT’s capabilities view and creates uncertainties and inefficiencies in day-to-day operations. Running IT like a business requires budgets to be based on services demands, rather than expense codes. Limited financial and business management background — Financial management is not stressed across the IT organization, instead seen as a specialized role important for ITFM managers only. Service managers and IT generally lack basic financial management background that could provide them important insights. But there is good news for the IT organization. Check back, and I’ll share more details about the ITBM SCP solution and the four key areas in which it addresses these challenges. This entry was posted in CloudOps and tagged "cloud operations", CloudOps, IT Financial Management, ITBM, khalid hakim, operations transformation, SCP, vmware cloud ops on February 20, 2014 by Heidi Pate. Attending VMworld? Please join my group discussion on IT Financial Management (OPT1004-GD) on Monday, August 26th at 3:30pm PT in Moscone West, Alcove 3. Hope to see you there! This series looks at what it takes to transform a traditional, passive-order IT operation into a cloud-based IT ‘shop’ selling services – turning what’s typically regarded as a revenue drain into a business enabler, revenue supporter, and value creator. In part one, I suggested a few key points to help you identify how much each and every service in your cloud service catalog is costing your company. Now, let’s place those services within a broader context: to deliver IT as a Service and run IT like a business requires a business mindset and a business model. So what should that model look like? To start off, take the key business functions of manufacturing organization. These include (but aren’t limited to) product manufacturing and management, sales, marketing, HR, and finance. The product manufacturing department is responsible for using raw materials, machinery and labor to create a physical product (i.e. a mug). Its marketing and finance teams then establish a unit cost for the product and set a pricing strategy. Marketing helps with product promotion, sales does the actual selling, and finance is a horizontal layer across all these functions to ensure that the organization will stay in business. Now look at the IT organization as a service broker. What does it need on top of the traditional IT planning, project and service management, architecture, development, and operations functions? Answer: a business practice within IT that penetrates every function across the stack. If you want IT to be a business-trusted advisor, in other words, then functions similar to those of the manufacturing business need to be deployed to help run the IT service factory as a real business. Product management (i.e. service management), sales, and marketing functions will facilitate and market service provisioning, and a finance function will account for service costs and encompass planning and budgeting for investments. It might sound like I’m just suggesting that IT requires an improved focus on investments that help the business generate more revenue. And sure, such an organization could be described as business within a business. But, in this case, IT is the business! I call this model the Cloud Financial Services Model. At its core is a focus on the Accounting, Budgeting, and Charging/Showback processes. These are the basic processes around which you can flesh out a full service broker business, as shown in the diagram below. – Service Accounting: A full accounting of the service costs and expenses incurred will include tracking actual services costs, allocating all IT costs to services being offered, and correctly categorizing costs in terms of Fixed and Variable expenses, Direct and Indirect costs, Period and Service costs, and CAPEX and OPEX. Failing to allocate or miss-categorize these costs will impact your overall cost accuracy and transparency. – Service Budgeting & Forecasting: This covers the process of predicting, anticipating, and controlling your organization’s services investment and any other planned expenditures on both an annual and ongoing basis. – Service Charging and Showback: The showback is a reporting of cloud service consumption and costs, but is a step prior to charging as there is no actual billing involved. 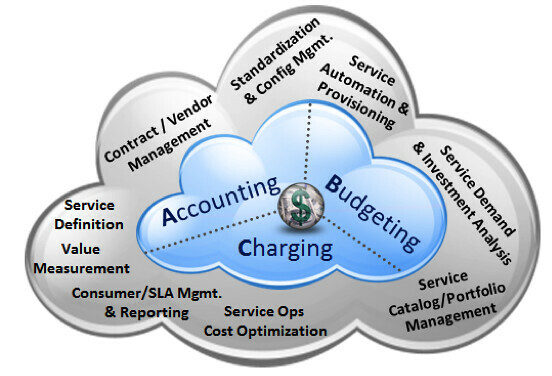 Charging is the process of pricing and billing cloud service consumers for cost recovery and value creation. – Service Definition: Your cornerstone, 360-degree process for reviewing a service, covering business and consumer management, and service and operations management. This includes identifying all the components making up the service chain and all cost drivers and their associated cost classifications & categorization, along with allocation bases. It will also, in turn, drive overall service costing accuracy and improve cost transparency. – Service Catalog/Portfolio Management: Your service catalog is the one-stop shop from which your consumers pick and choose services, so it must contain the right level of information, including cost and/or price. A service portfolio management budgeting and planning-based approach can help realize investment value far better than component- or project-based budgeting. Also, aligning IT cloud portfolio investment categories with business categories is a key step to the path to turning IT into a generator of business value. – Service Demand and Investment Analysis: Understanding the demand and performance requirements of both the business and cloud services will help drive a planned demand pipeline that in turns boosts the overall cloud service workload’s efficiency. – Standardization and Configuration Management: Standardization and realistic configuration management drive simplicity in service automation and provisioning, and hence efficiency in overall operations. Creating standard cloud service offerings with a high degree of standardization and automation results in operational expenses (OPEX) savings. – Service Operations Cost Optimization: Continuously looking for operations improvement opportunities is necessary along the operations journey. New cost drivers may continue to pop up during cloud service operations (especially privately operated ones) and thus IT management may run into cost overruns when unmonitored. – Value Measurement: It is generally important to consider a combination of financial measures (such as reduction in costs, revenue increases, and productivity improvements) and non-financial measures (such as performance, satisfaction and compliance). – Consumer and SLA Management & Reporting: Running strategic service reviews with consumer stakeholders ensures the continuous alignment and meeting SLA expectations – and that they’re getting value for their money. Producing a bill of cloud services consumption and total cost incurred to consumers is one of your key reporting and billing activities. It can kick off service improvement initiatives, driving service quality while optimizing and lowering costs. – Contract and Vendor Management: One way to look at cloud computing is as a new delivery channel for IT services. As a service broker, an IT organization acts as an advisor trusted to provide the required services to its consumers at the right quality and cost, regardless of where those services actually reside. Contract & Vendor management becomes even more important with public cloud services to ensure that service levels are being met and that demand is being proactively managed. While the core Accounting, Budgeting, and Charging IT financial management processes are required for the cloud business management, those in the model’s outer layer represent the cloud-specific activities that will actuate your cloud financial management practices on the ground. For example, Service Definition is a cornerstone activity as you need to define the boundaries of what you want to offer for each service. You can’t manage what you can’t control, after all, and you can’t control what you can’t define. Indeed, everything starts with defining your cloud services – of which service accounting and pricing become key activities – followed by publishing the right information to a broader IT service catalog. Service demand and investment analysis is then required to plan for future demand and to deliver services more efficiently at the right quality level, and so on, down the list. The bottom-line: The Cloud Financial Services Model reflects how cloud service management activities are strongly tied to financial management core processes. Adopting it will help position you for success as you seek to transform IT from a cost center to value creator. Delivering IT as a Service and running IT like a business requires a business mindset and business model. The Cloud Financial Services Model is a useful business model in this regard – offering a core focus on Accounting, Budgeting, and Charging/Showback (ABC). The model also includes the various Cloud Service Management Activities via which you will deliver your financial processes. In my next post in the series, I’ll take you though a cloud service costing exercise to show how you can calculate a cost for a specific cloud service. This entry was posted in CloudOps, Events, Guest Blogger, Informational, Thought Leadership, VMworld and tagged "cloud computing", cloud financial model, CloudOps, IT Financial Management, VMworld on August 25, 2013 by khalidh.